Our days of stopping at a Little Chef for lunch when heading for the West Country down the A303 are over. 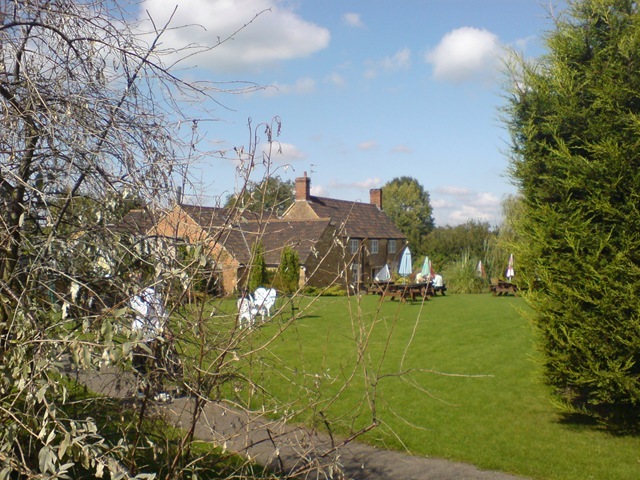 A week ago, we discovered a wonderful pub called the Crown & Victoria (above) just off the main route to the west in the intriguingly named village of Tintinhull in Somerset. The staff were wonderful, rushing our food order through despite having a big wedding party in the conservatory, so our nine week old baby wouldn't be put out. Today, we made a beeline for the pub on our return home. We weren't disappointed. I recommend the Ploughman's! We used to enjoy having lunch at a Little Chef. But why struggle for a parking space at Little Chef knowing that you'll wait an hour for your very ordinary meal when the alternative is a genuine welcome and home cooked food in a lovely setting? Can you save the world and enjoy organic food? Dominic Lawson's Independent column recently raised a crucial question: can you enjoy organic food and help third world farmers? Abel & Cole said they never air freight anything and never will, as it's hugely destructive of the environment. My personal preference is to buy food that's in season and from Britain or Europe. But I can understand critics who say this is too simplistic. Food grown thousands of miles away may take less energy in its production and transport than its equivalent grown down the road. This is not a simple issue and we need to balance the needs of third world farmers with concerns of the environment. I doubt that anyone shops around for the cheapest mints. But perhaps we should, given my discovery that WH Smith are overcharging on an extraordinary scale. I can pick up a packet of Trebor Soft Mints for around 44p in the newsagents at Canary Wharf - hardly a bargain basement venue. But WH Smith charge an eye-watering 57p - more than 25% more. And they wonder why they're in long-term decline! Anyone wanting an all day breakfast on the road can relax again: Little Chef has been saved. The chain of roadside restaurants was under threat after a series of ownership changes and the rise of healthy eating. I'm glad, as I used to enjoy the treat of a fry-up when driving to Cornwall or North Wales. We stopped at one near Ross on Wye en route to my graduation in 1985. I doubt that healthy eating is to blame for Little Chef's plight. Slow service is a more likely reason in today's rush-rush world. I was reminded tonight why I stopped buying fruit in Tesco. 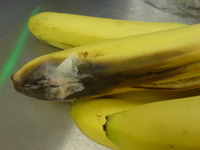 Luckily, I spotted this rotting and furry banana as I got to the checkout. Time to add fruit to our weekly Abel & Cole order! I usually avoid motorway service stations. The food is dreadful and overpriced. The facilities are grim and uninviting. So when I pulled into Roadchef's Stafford services on the M6 last night for a snack, my expectations were none too high. I was very pleasantly surprised. The food was enjoyable. I got two large mugs of tea from the pot. And I ate my food on a quiet terrace overlooking a small lake - perfect on a glorious summer's evening. One to recommend rather than avoid. Do you automatically bin sales leaflets that drop through your letter box? I usually do. But last winter, we received an appealing-looking flyer for Abel & Cole, a London-based supplier of organic food. We gave them a go six months ago - and have been delighted. Food to restore anyone's jaded palate. We usually go for the organic veg, but recommend the fruit as well. We pay £11 for a box of mixed veg, which is enough for the two of us for a week. The price includes delivery. Who says entertaining is hard work? We enjoyed slaving away over a hot stove this Christmas and New Year. Thank you, Marks & Spencer!